Hello everybody! Yes, its been ages since my last article but I was so caught up for the last 3 months firstly with our college event 'Odyssey' , the diwali vacations travelling around India, tons of college assignments and finally a huge family wedding but I'm back and I promise to be more active for the last month of 2016 and come next year. 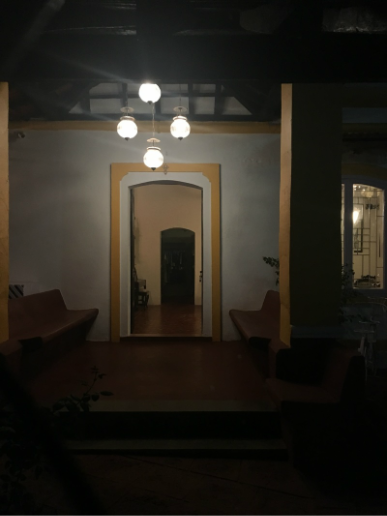 So, I'm back with another post on another restaurant in my hometown, the lovely and the beautiful, Saligao. Saligao Stories isn't officially open to the public yet but should be up and running with open doors to everybody very soon. The quaint restaurant is located in the Mudda Vaddo region of Saligao which you can reach by either taking a right into the lane straight after St.Anne's Chapel when coming into Saligao from Porvorim or even better by taking the immediate right lane after the popular Sainath Cold Drink House after which you can spot straight ahead, one of the walls of the house with an artistic dual inverted 'S' logo followed by Saligao Stories boldly painted on to it. Arshekaniche Ghor (due to the number of Glass windows it had) as its called in Konkani in these parts by the people who live here and knew its previous owners, including a few of my family members that have distant memories of playing in this very house, has recieved a total makeover, from the paint job to the layout, of course leaving intact the structure and the essence of the property. 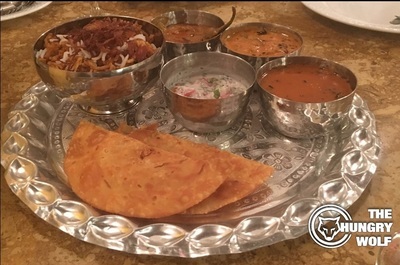 The restaurant is run with the joint efforts of Mrs. Anisha Hassan Mendes and Mr. Siddarth Hegde along with the help of their super efficient team. Siddarth who's last stint was at Barrels & Bines in Fontainhas in Panjim now spearheads the kitchen along with Aaron originally from Mumbai who has managed to pick up the local language quite well in his time here, '' mashe konkani yeta maka '' as he told us when he graced us with his presence during the course of our meal to give us an intro to a few of the dishes. Siddarth greeted us personally as we arrived into the big, old beautiful house and man was it beautiful. From the paintings on the wall, to the flowers and the set up, to the baby grand piano tucked into the corner. The set up of the restaurant is visually stunning and thats something to be commended, its not an easy task but those who can visually impress customers before they even order their meals have a massive advantage. The blend of sheer grandeur and simplicty that they managed to pull with the decor right from the front yard to the restaurant, to the backyard and right to the very nook of the washrooms. The intricate details like the jute ropes that held the light bulbs, to the wooden wadrobes, the paintings from local artists for sale to the public to all the pictures of the past inhabitants and the Saligao of yesteryears. This place certainly knows how to tell a story by itself. Do take the time to go through the below slideshow to have a glimpse of within the restaurant. Now then, lets move on to my dining experience. We experienced a short power cut at the beginining which is normal in these parts but the lights were on sooner than expected, in that short powerless span however we were greeted by Anisha who is the owner. She is the great grandaughter of the man who owned this house and returned to take it over so that she could start doing what she does and loves best, cooking. We talked for a while and bonded over the beauty and tranquility of this little village and also invited her to our house in Saligao for a cup of tea someday. ​We then met Siddarth once again who suggested that we begin our meal as the lights came back on. We decided to have a few cocktails and asked him to suggest what he felt were a few of the best he had to offer. We ordered 3 cocktails the the first of which was an Espresso Martini, your usual martini infused with Baileys Irish Cream as the key ingredient. Simple. Our second cocktail for the night was a Dark Rum Spiced Mandarin Mojito again your usual mojito, but with dark rum as the base instead of white rum with a slight spiced flavour and a mandarin(tangerine) base instead the usual lime, the play with the ingredients worked beautifully and the fusion of the spice and the citrus zing from the mandarin worked well and hey who knew dark rum would be just as good in a mojito as white? Lastly, our third cocktail of the night was one called Smoke on the Water which made me smile in accordance with Siddarth when he told me it was one his favorite songs as it was one of mine too. 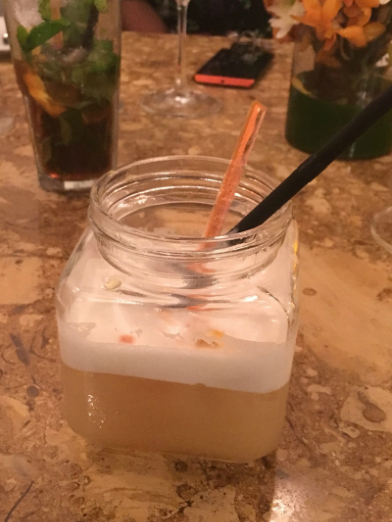 The cocktail was not your usual sweet one and had a slight citrusy sour note to it thanks to the mixture of the two key ingredients, Pineapple juice and Jack Daniels whiskey, sounds far fetched huh? Don't worry it not only tasted great and refreshing but also looked good! Just like the story of smoke on the water, when the theatre in Switzerland which famous rock band Deep Purple were supposed to play in tragically caught fire and the smoke spread out across the surface of the Lake Geneva, this cocktail certainly looked its part. ​Finally, it's food time! Since the restaurant isn't open yet they did not have a formal ready made menu with prices but they did have a preview menu with a quite a number of dishes to try out and we chose a couple of them. 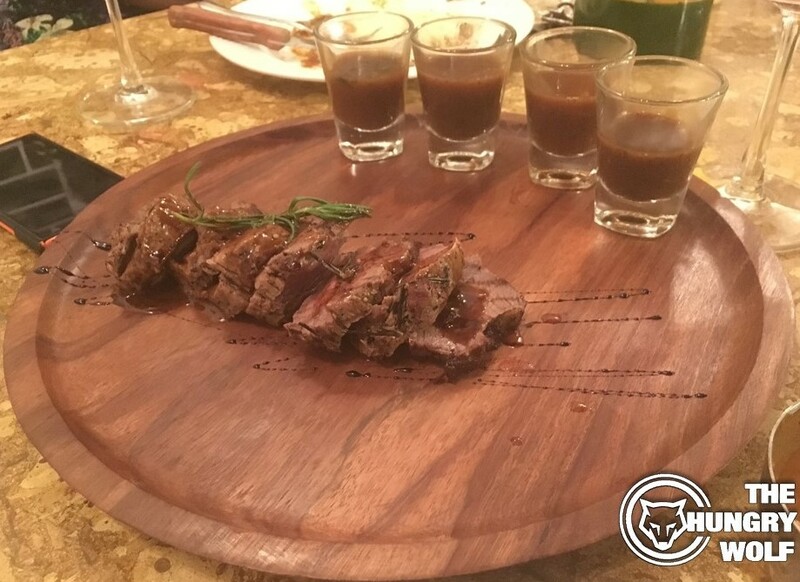 As we sipped our cocktails, the first dish to arrive at the table was the Rosemary Pepper Beef Steak which was chopped beef fillet cooked and served in a pepper-rosemary gravy with a side of roasted potatoes garnished with herb. The standout of this dish was definitely the gravy in which the tender meat were lying in. The peppery, relatively thick gravy was not too heavy thanks to the infusion of the rosemary which made it a bit tangy and well balanced. Upon finishing the dish, we were left pondering whether to ask for bread so we could scoop up all the remaining gravy rather than the traditional stuff we do at home, I'm sure you know what I mean *wink wink*. 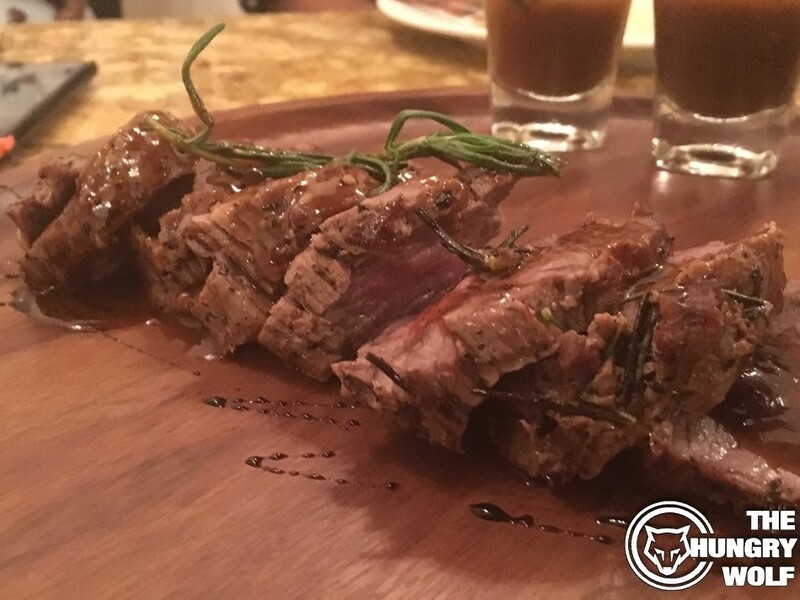 The exceptional start to our main course certainly left us yearning for more. Next up was a tapas style starter, Chorizo Dip on an Onion Biscuit. The Goan chorizo is made from coarsely chopped pork and pork fat, seasoned with smoked parika, salt, lemon, kashmiri chilies, garlic, ginger and much more, it had its roots in Goa during the Portuguese era and have now become a popular goan household dish. 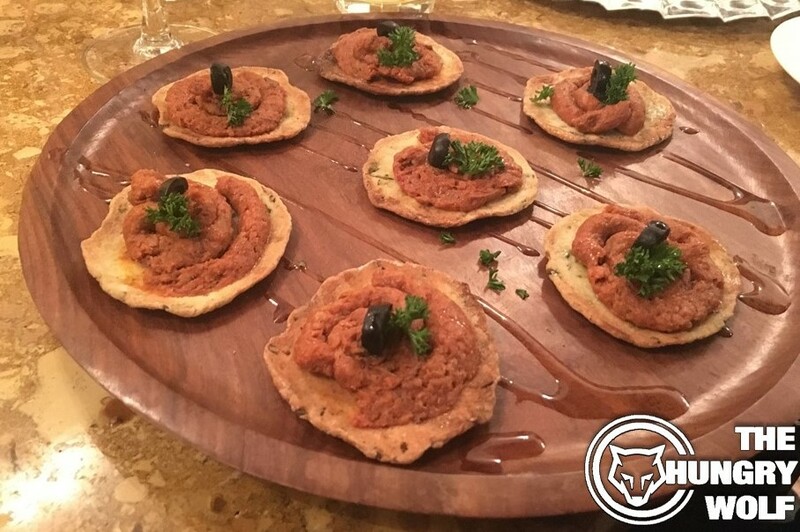 The dish consisted of a Chorizo paste with a dash of red wine to pack in that extra punch garnished, garnished with an olive on a bed of homemade onion biscuit drizzled with olive oil. The best part of Saligao Stories is every single ingredient is fresh and not canned or tinned. Who ever thought of a Chorizo 'dip'? The dish tasted great and was pretty smooth on the palate, made me wish I could have this during our late night footy matches along with an ice cold bottle of Budweiser. Perfecto! The third dish of the night was the Grilled Prawns in Lemon Mustard and Parsley Butter the prawns were cooked and marinated just right. Soft and Juicy with that citrusy, creamy taste and slightly charred towards the end. It went well with the sauce used to garnish it, which was a tad bit sweet but still managed to complement the marinade of the of the prawns. The prawns were served with arugula more commonly known as Rocket Leaf which added a lot more flavour and that pungent taste, which also took me back to my Abu Dhabi days and reminded me of fresh salads served with the grills. The whole dish felt like power packed punch of flavours straight to the mouth. A lot of the dishes on the menu had a Hydrebadi influnence on it so we decided to try that Hyderabadi Platter which was the next dish to be served, that featured Mutton biryani or Kache ghosht ki biryani a delectable Hyderabadi special served with sides of Mirchi Ka Salaan which is a curry made using Chili Peppers, tamarind and other spices that had a piquant and slightly spiced-roasted flavour. 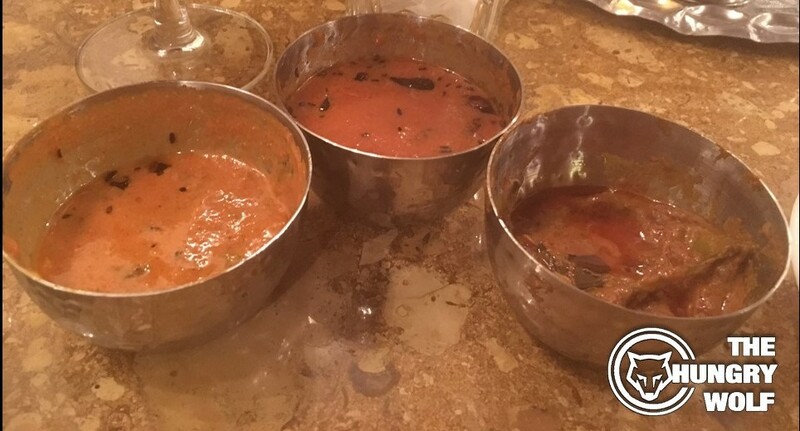 Tamatar Ka Kut which was a tomato based spiced curry that a nice tangy taste to it and finally Dahi Ki Kadi which was a yoghurt/curd based curry that had a sour, zesty taste to it. 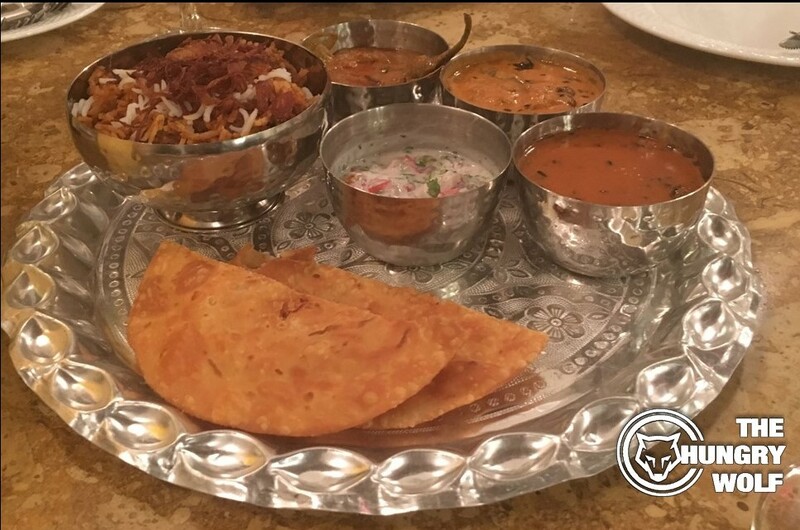 The curries could be tasted with either a bit of the biryani or the homemade cripsy bread that was served with the platter. The trio of curries were the highlight of the dish and full of exotic flavours. 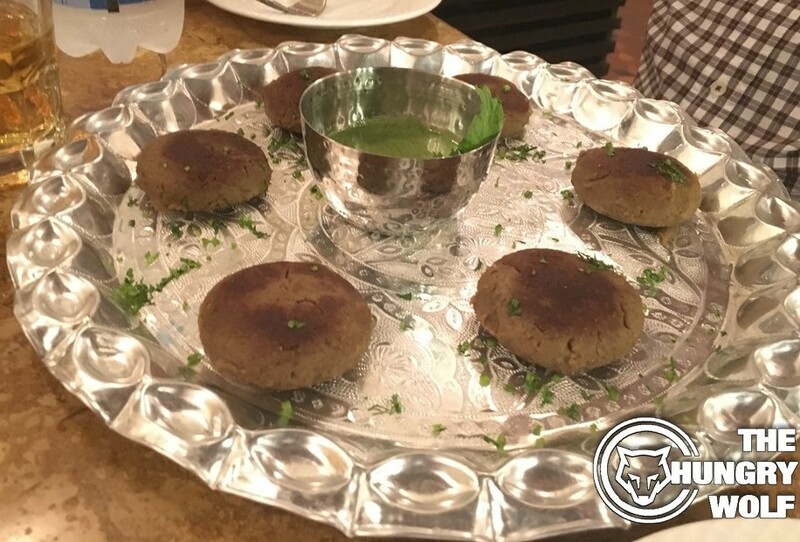 Along with the platter we also served with a plate of Shikampurs (Finely ground mutton kebabs) which were pre-marinated and then cooked on the grill and served with a classic mint chutney that helped add the flavour to the kebabs. For our final stage of the main course we were given a simple Green Salad which included iceberg lettuce, olives, herbs, cherry tomatoes and sundried tomatoes with a light dressing. The salad certainly helped take it down a notch and refresh us before our final dish. The final dish of our main course was a Beef Steak done two ways, one medium to well done (for my dad and brother) and one medium to rare. The steak was cooked almost to perfection, could have been slightly more juicier but wasn't very noticeable as it was coated with a demi glace sauce and served with 4 shot glasses containing 4 different sauces, the demi glace, a pepper sauce, a mushroom sauce and an oriental thai sauce. Each of the sauces had their own unique taste and all of them were great, but of course I couldn't resist mixing them. The demi glace, pepper and mushroom sauce I managed to make, may seem ridiculous but it sure did taste good. A good steak nonetheless, which was also served with a side of Mash Potatoes that came in a bit later. The key to a good mash potato in my opinion is the perfect balance of cream, milk and butter to give it that rich, fluffy, non-grainy, smooth, delicious taste. It's almost like they read my mind, the mash potato was perfect just to my liking and when topped with some of the steak sauces tasted even better, I couldn't stop myself from going for seconds and thirds and even a fourth helping. Nothing fancy, just a simple, herb infused fluffy mash potato. Wholesome and Hearty! Green Iceberg Salad, The calm before the storm! Now we come to the final stage of our night at Saligao Stories and thats Dessert. They say 'There's always room for dessert', to be honest though it looks like we had quite a lot, if you noticed they were barely any carbs and hence we weren't very stuffed up and felt realtively light and good thanks to minimization of carbs and the Sula wine. We tried two bottles, one Cabernet Shiraz and one Cabernet Suavignon. For the dessert we ordered just one item, but before we were served that we saw Aaron stepping out again one more time with a bowl of what he said was Shahi Tukda as a token of appreciation. The dish could be viewed as a desi style french toast, the dish (again Hyderabadi) consists of bread deep fried in ghee and then soaked in rabri (Sweet Condensed milk with spices) topped with chopped almonds and a dash of rosewater or petals. Our final dish of the night was homemade tender coconut ice cream which was made in house and from the fresh coconuts of the coconut trees that were cleared to make space for a parking lot in the backyard. So yes, just like all the dishes, even the ice cream had a story behind it. The Tender Coconut Ice Cream was rich, creamy and milky. It tasted a bit more of milk than coconut but all in all I'm a sucker for anything made out of coconut and appreciate that it was made in the restaurant and fresh. The ice cream was certainly the icing on the cake and the perfect end to a great night at Saligao Stories. The experience at Saligao Stories was great and in the end the food managed to reach the level of the atmsophere and expectations that the decor and set up laid down. The food is a bit pricey but expect nothing less for food of this quality, so grab your friends and family, come on down to Saligao Stories with your pockets full and you'll surely leave with a full stomach and all your money's worth.